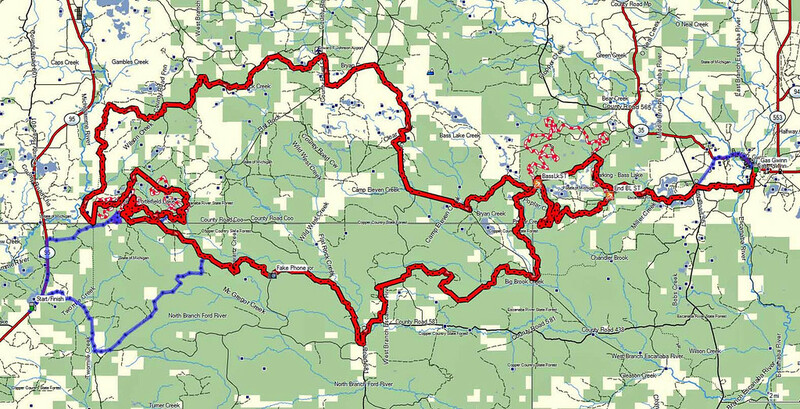 Discussion in 'GPS Tracks - Central, Texas & Gulf States' started by Cannonshot, Mar 4, 2013. This is about a 200 mile dual sport ride that is loads of fun. 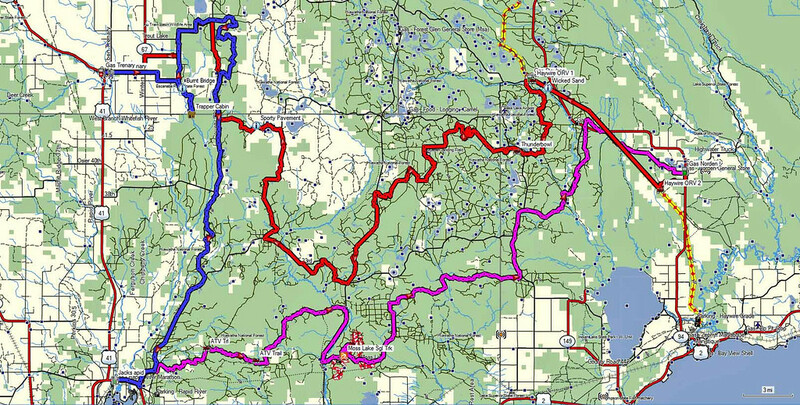 It includes many obscure two tracks, some motorcycle trail single track, sporty ATV trail, railroad grade ORV trail, scenic forest roads, and a trip to The Thunderbowl - a USFS ORV play area. Although it was designed to be started in Rapid River running counter-clockwise (the roadiest part - that was intended to be saved for the end when you are tired - is the segment between Trenary and Rapid River), you can start it anywhere and have an exceptional dual sport ride. 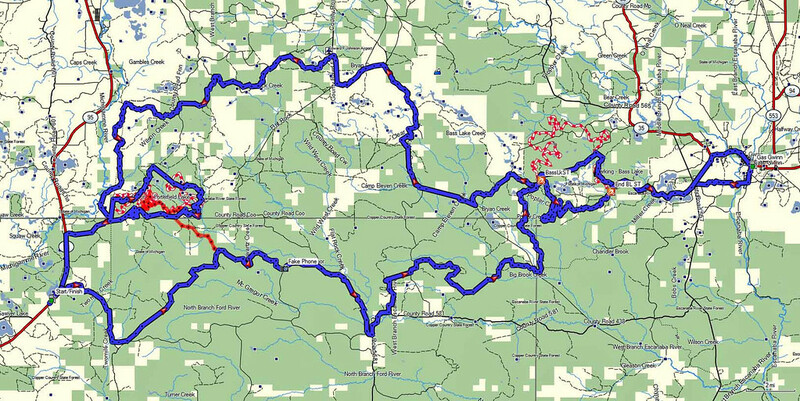 A good approach would be to ride the 50 mile track from Trenary to Rapid River to have breakfast at Jack's Restaurant. Top off and then ride 66 miles to Norden and get gas. The segment from Norden back to Trenary is about 80 miles. For those that might have a gas constraint, top off again in Stueben (just before the Thunderbowl) and you will be quite comfortable. If you ride the entire track, plan to be back to Trenary just before the evening meal. If you are not set up for single track, you can easily skip that segment. There is some soft sand before you get to Stueben on the ORV trail. Just take to the roads to avoid it. 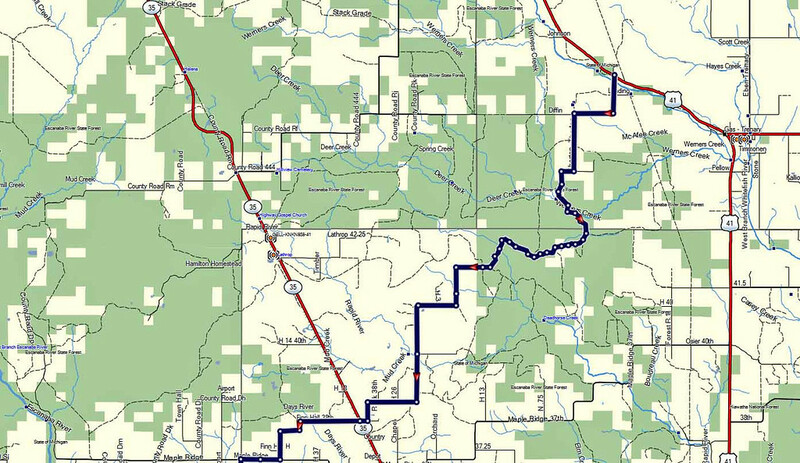 This is a loop that runs from Trenary to Munising and back. It runs about 100 miles. 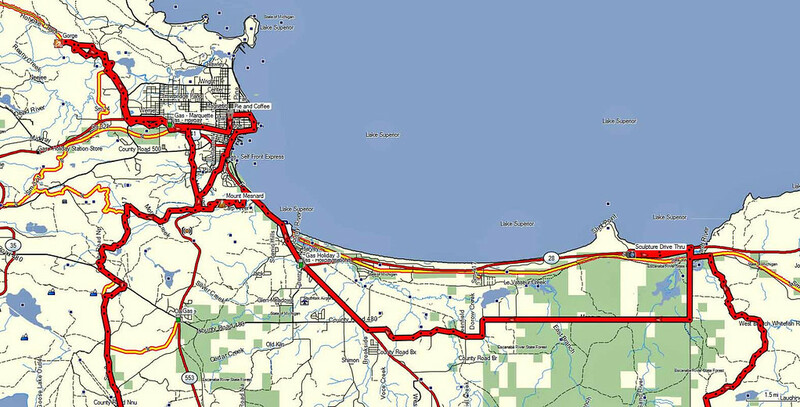 The first leg from Trenary to Munising is about 60 miles. This is a fun one once to you off the higway. Watch for a small stream crossing on the second sporty section that could surprise you. This one takes in some sporty two tracks - real sporty. You can also visit a lifeboat station at Pictured Rocks. Nice restaurant waypointed downtown (casual). Some RR grade ORV trails as well. 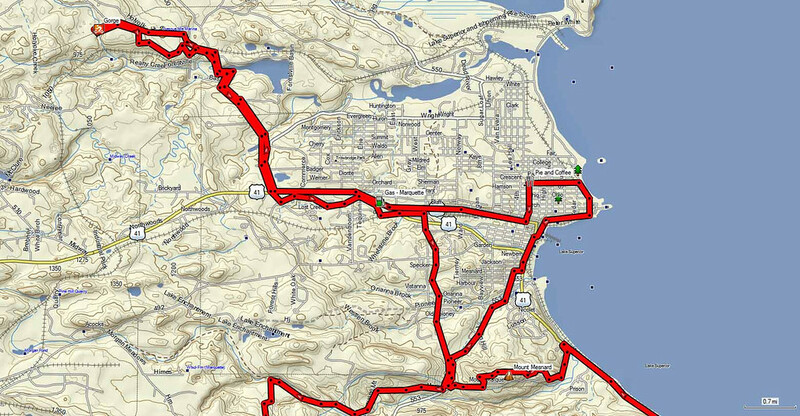 This loop runs about 100 miles and runs up to Marquette and back. 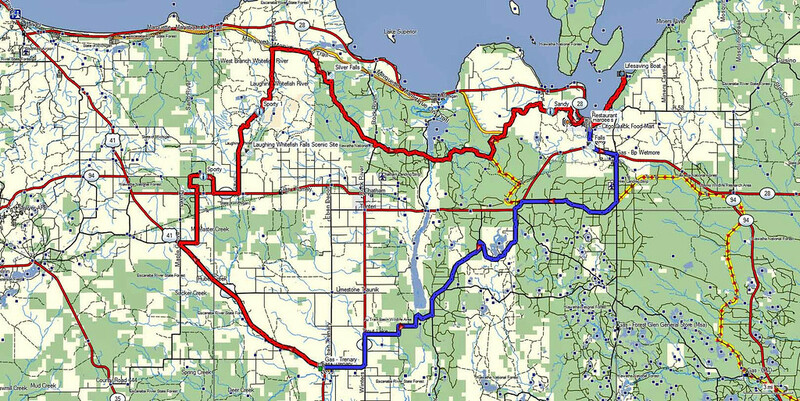 Some highlights on this route include: a drive through sculpture exhibit, Mount Mesnard, the ore dock in MQT, pie and coffee, a trip to the gorge, and a stop in the sand pit at KI Sawyer. There is plenty of gas around so there are no constraints. 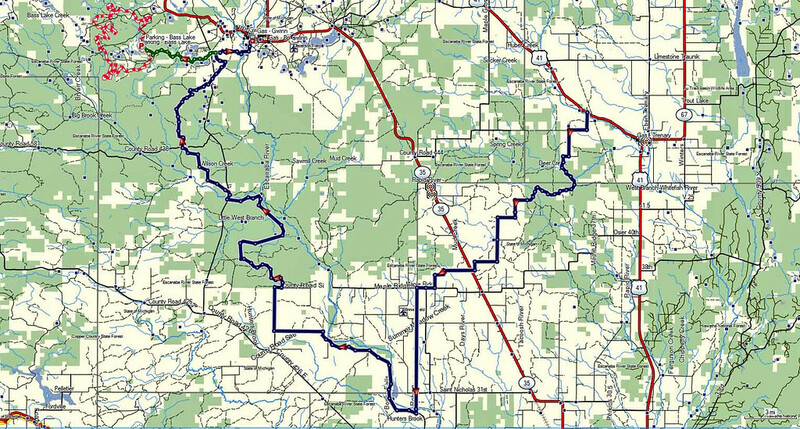 This loop has two options for taking in a nice ride that loops the area around the Bass Lake and Porterfield Single Track Motorcycle Trails. It is a dual sport route that takes in a bit of each trail but focuses more on the sporty ride in between. You can trailer to Gwinn and ride either a dual sport or OHM from there. There is a track for bikes that are not street legal, but your gas situation will be difficult at the Porterfield end since you ar enot allowed to go down the State highway to get gas. The DS loop is about 115 miles and the OHM about 105. Gas is available at Silver Lake for the DS loop roughly in the middle of the ride. Blue is the DS loop. Red is the OHM route. This track allows people to have an interesting ride from Trenary to the Bass Lake Single Track Motorcycle Trail near Gwinn. The run down Diffin Road is a sporty one. Once you cross the river and head back north toward Gwinn, you are treated to another excellent dual sport run. It is about 70 miles to Gwinn. 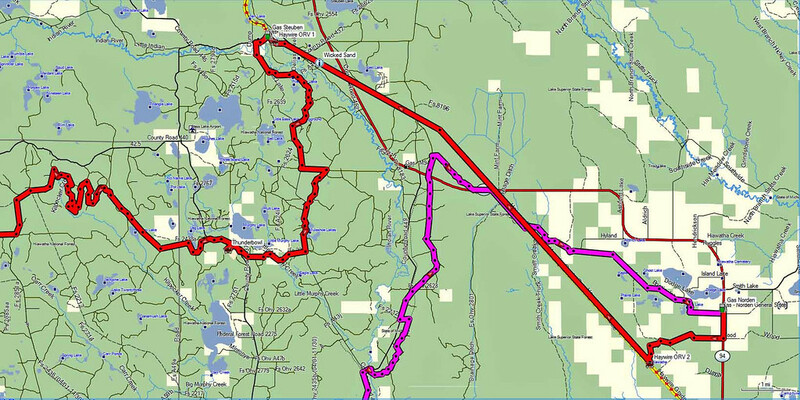 You can top off and then ride about 6 more miles to the Bass Lake trailhead. 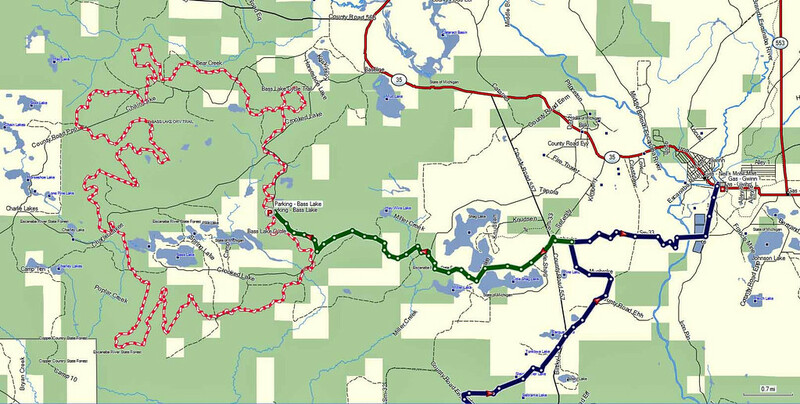 The trail itself is about 25 miles long. A trip back to Gwinn to top off and a sporty run back to Trenary. 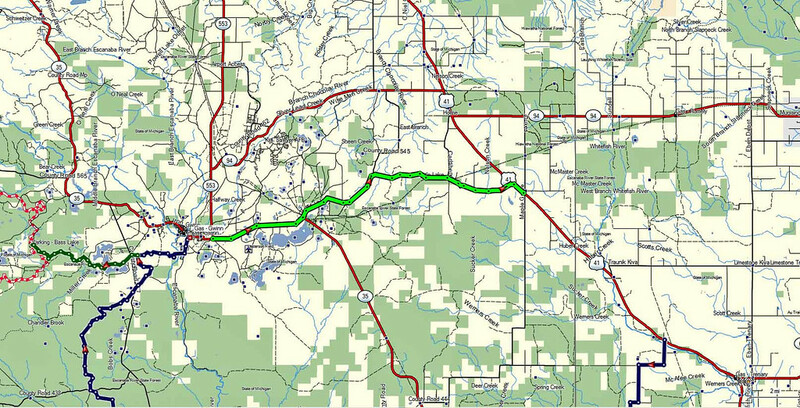 Of course, you could take the roads back to Hwy 41 instead of backtracking the entire route.